If you aren’t already leveraging video marketing in your emails, you’re behind the marketing curve. In a 2013 ReelSEO study, 93 percent of respondents said they were incorporating video in their marketing campaigns — and 60 percent claimed to use videos specifically for email marketing. Since then, the prevalence — and sophistication — of these video marketing efforts has only increased. Map out your strategy for using video in your emails. If you have a smartphone, you have the ability to create a marketing video for your business. However, there’s a lot more that goes into video marketing that capturing two minutes of footage. It takes time to script out your video, plan for your shoot and edit your video post-shoot. Then you have to figure out where to host your videos and create the emails that deliver video to your audience. Having a strategy in place before you start production will ensure that you get the most out of the time and resources you put into your videos. Engage top-of-the-funnel leads. The strategy may be to create a how-to video series or email course – check out our email course for inspiration. Create a sales tool. Your strategy might be to record a product demo or to produce an interview series with your key employees. Re-engage customers. A strategy may be to enhance your customer knowledge base with how-to product videos. Your overall strategy might influence how you decide to host your videos. For instance, YouTube is perfect if you want to reach a large audience and allow others to share and embed your videos. A host like Vimeo is ad-free and offers privacy settings – which may be ideal if your strategy is to create a new revenue stream by offering a video email course. Wistia video hosting tracts engagement stats and allows you to add a call-to-action link at the end of your videos – a great option if your strategy is to create a product video with a call to action at the end. With your goal in mind, chart out your email strategy. Is it a simple drip campaign that visitors can sign-up for on your website? Or are you adding a video to an existing campaign to boost engagement? Mapping out the email strategy from the beginning can help clarify how to shape video content – which is super important, because you only have 10 seconds to capture your audience’s attention (according to Video Brewery). Keep short attention spans in mind. Email recipients must wade through dozens or even hundreds of messages. They have no time to spare for lengthy videos, but they will set aside a minute or two for a concise clip. The ideal email video is, at most, two minutes long. If you struggle to fit your entire message in just one short video, consider creating a series of videos, with each lasting between 30 and 45 seconds. 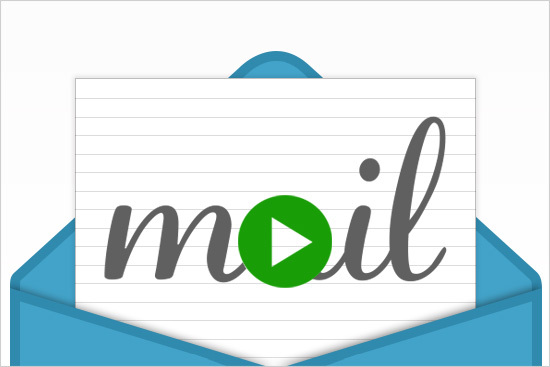 These short videos can quickly hook email recipients and get them excited for what’s to come. Be sure to let viewers know that they should expect follow-up videos in the near future. Be authentic, but edit yourself. Avoid unnecessary distractions – like a barking office pet or water-cooler discussion getting picked up in the background. Take note of your surroundings – if filming in your home office, for instance, get that laundry basket out of the shot. Deliver value – Know your message backward and forward and don’t dance around the point you want to make. If your video goes on too long without delivering value, viewers are going to tune out. Now that you have their attention, tell your audience what to do next. Merely linking to video in your emails is not good enough. Your should also feature a call to action, ideally within the actual video or, at minimum, in the email’s text. Video-based calls to action are especially effective, as they encourage viewers to check out other videos, thereby further exposing them to your brand. The easiest video-based calls to action are verbal, with the subject encouraging viewers to click provided links or view follow-up videos. However, brands with more developed YouTube channels can achieve greater response rates by editing in annotations. When clicked, these annotations lead viewers directly to the next video. Additionally, video-based calls to action can include links that encourage viewers to subscribe to your YouTube channel or check out your social media pages and official website. Create your email for the 99%. Now that your video is ready to go, it’s time to add it to your email. With the latest HTML 5 standards, you can technically embed a video in an email that will play right in the recipient’s inbox. And while that seems like a simple solution, keep in mind that email clients are a fickle bunch. What looks great in one email client may appear wonky in another. Email clients are notoriously hard to please, and getting your emails to render correctly across all of them is always a chore. In fact, email delivery service, SendGrid, advises to not embed video into emails. Video hosting service, Wistia, also has some solid arguments against embedding video into your email. Instead, SendGrid, Wistia and most others with authority on email and video recommend simply using a thumbnail or GIF link to your video. As a bonus, when you use a link to your video in your email, you can track who has clicked to watch your video. If your goal is to cultivate a dedicated following, using video in your email marketing strategy can transform any run-of-the-mill email into an effective tool for increasing customer engagement. Can Snapchat Help You Reach More Customers?